Appointed Music Director of Mississauga Pops Concert Band in April 2017, Andrew Chung also serves as Music Director of Counterpoint Community Orchestra and Silverthorn Symphonic Winds. While attending the University of Toronto, he was appointed Music Director of the Pickering Philharmonic Orchestra and Assistant Conductor of the University of Toronto Symphony Orchestra. 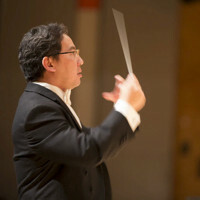 He has also served as guest conductor to the Cathedral Bluff Symphony Orchestra, the North York Concert Orchestra, Toronto Philharmonia, the Korean Canadian Symphony Orchestra, Northdale Concert Band, the Hong Kong Symphonic Band, the Hong Kong Symphonic Youth Band, and the Hong Kong Chamber Wind Philharmonia. Prominent artists he has conducted include violinist Moshe Hammer, hornist Christopher Gongos, flutist Camille Watts, clarinetist Peter Stoll, and baritone Peter McGillivray. As an orchestral musician, Mr. Chung served as the principal trumpet with the Hong Kong Chamber Orchestra, the Hong Kong Youth Symphony, the Asian Youth Orchestra and the Toronto Symphony Youth Orchestra. He made his solo debut with the Mooredale Festival Orchestra. Mr. Chung attended the Hong Kong Academy for Performing Arts, the University of Hong Kong, the University of Toronto and the University of Freiburg, Germany. His trumpet teachers included Stephen Chenette, Robert Nagel, Henry Nowak, Jeffrey Reynolds, and Larry Weeks. He also studied privately with Arnold Jacobs and Murray Crewe. A scholarship from the Centre d'Arts Orford allowed him to study conducting with Raffi Armenian and Agnes Grossman. He has also participated in the Conductors' Apprentice Program with the Huntsville Festival of the Arts Orchestra. His other conducting teachers include Dwight Bennett and Kerry Stratton.